f you know all about tourbillon watches, then none of this should be surprising or new to you. If you don’t, you might have a couple of outstanding questions as to what a tourbillon is, why prestigious watch makers say you should want one, and why they are so expensive. The tourbillon has been around for a long time and was patented by watch making master Abraham Louis Breguet in (who founded Breguet watches that is still around today and owned by the Swatch Group) in 1795 and patented 1801. That patent has long since expired. Tourbillon is French for “whirlwind.” This is because the mechanism literally spins on itself. Breguet’s ideas was essentially to house a clock within a clock. While this characterization is a bit off realistically speaking, you have a balance wheel (that rotates), rotating on itself. If you understand the concept of a balance wheel, you know that it does not just turn endlessly in one direction. Rather, it moves in a back and forth manner, like a revolving pendulum. This is often referred to as balance wheel oscillation. 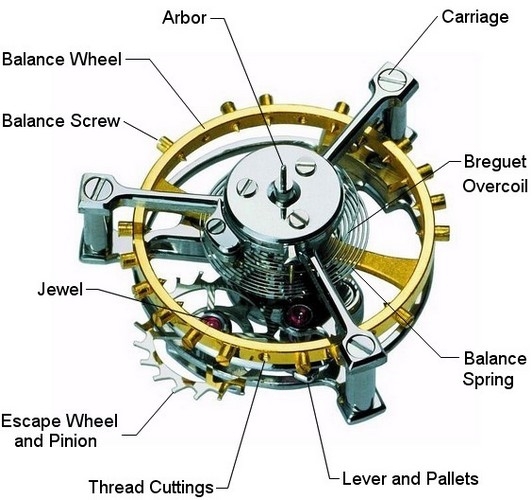 In fact, a balance wheel is a pendulum, and the consistency of its back and forth rotations are the basis for mechanical watch movement accuracy. So a tourbillon is a balance wheel that itself rotates, but the balance wheel rotates in one direction (not oscillation), and it typically make full rotation every 60 seconds, but sometimes every 30 seconds. For this reason, the tourbillon is often used at the seconds counter when it is used in a watch. A convenient way of putting in a seconds counter. The main idea behind why a tourbillon is supposed to work, is that the balance wheel rotates to all positions equaling out the effect gravity might have on it being stuck in one position. So if the balance wheel is constantly moving, then minor deviations here and there will be canceled out. Again, this was the theory, and it has not necessarily been shown to actually work, or make a difference when it comes to watch accuracy. Most watch makers actually agree that even if the tourbillon perfectly cancels out rate affecting effects of gravity on a balance wheel, this is not the key to ensuring accuracy. As such, tourbillon watches are far from the most accurate watches around. There are different types of tourbillons. You may hear of traditional tourbillons (one axis) and flying tourbillons, along with various terms to refer to multi-axis tourbillons. 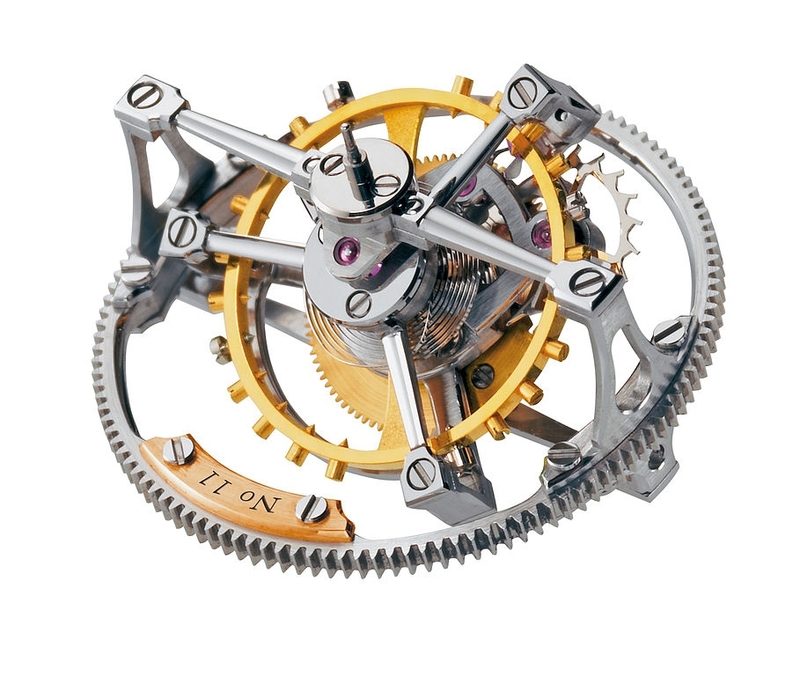 Traditional tourbillons use what is called a bridge, that is part of the mechanism that holds it in place. This is literally the (usually metal) piece over the tourbillon, around which is free viewing of the tourbillon in operation. A flying tourbillon is a special type of construction purely for aesthetic purposes that removes the bridge for “unobstructed view” of the tourbillon operating in its natural environment. Here there is no bridge, but rather the tourbillon is connected to the movement from underneath. 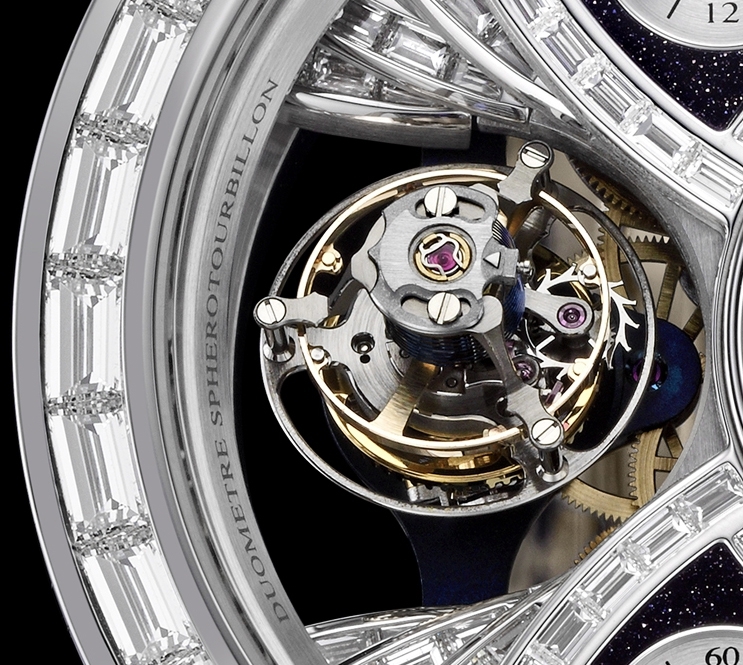 A flying tourbillon is entirely a complicated cosmetic touch. A tourbillon is placed in what is called a “cage.” This cage rotates and houses the balance wheel that oscillates within. Most tourbillon movements operate on one axis, but some exotic “multi-axis” tourbillons move around on two or more axis points. The best way to think about this is picturing a gyroscope, or one of those human gyroscope rides. The idea is to have the balance wheel moving around in three, versus two-dimensions. The goal of a multi-axis tourbillon is provide gravity canceling out effects for a watch no matter what position is in which is likely as ones wrist moves around a lot. The irony, is that multi-axis tourbillon movements are so expensive, you aren’t going to have owners wearing them too often. No matter what type of tourbillon used, the idea is the same, to counteract the effects of gravity that may alter the accuracy and reliability of a balance wheel’s oscillations. Breguet’s initial theory was that pocket watches, which are usually carried in the vertical position, suffer from accuracy deviations due to the effect of gravity on the ever moving balance wheel. While this theory might have been sound for pocket watches, it does not really carry over well to wrist watches; not only does it not at all take into account that construction of the watch itself may affect reliability, but research has shown that Breguet’s theories on tourbillon rate improvement are often not accurate. Meaning that all the effort that goes into making and implementing a tourbillon movement does almost nothing to increase accuracy. As such, a chronometer watch is vastly more accurate than a tourbillon. Moral of the story being that tourbillons don’t do much to make watches more accurate. Instead, a well constructed watch that is finely tuned will beat out a tourbillon based watch anytime in terms of accuracy. I must admit when I first learned of tourbillon watches I was under the impression that they must be the most accurate mechanical watches out there. I now know this is not true, but I also know that they are simply not very accurate at all. The migration of the tourbillon from pocket watches to wrist watches was instigated by a few of the most expensive and complex watch makers purely for “I can do it” prestige. Audemars Piguet and Blancpain, among others headed this movement. The first tourbillon-based watches were interesting, but lacked much of what people needed in a watch. They were delicate, manually-wound, and often not very easy to read. Later, automatic tourbillon movements arrived along with a number of aesthetic and functional variations, but of course the nature of the movement provided that it would always be delicate. As such tourbillons will always remain mechanical art and objects of curiosity, rather than watch improving technological innovations. There are really only two reasons for a tourbillon-based watch, and neither of them have anything to do with increased accuracy or reliability. First is visual interest. A tourbillon is cool to look at. It is always moving and really makes the watch seem more alive. This is especially true with the multi-axis tourbillon movements with their constant gyration. The visual splendor is there, but arguably not worth the incredible premium. The second reason to have a tourbillon watch is pure showiness and prestige. These are very complex watches, with unorthodox movements in areas much smaller that traditionally required for a tourbillon. It is basically saying to people, “Look, I can afford a watch that has a lot more moving parts than your watch, doesn’t it just look really complicated!” I am not saying this is a bad reason, but again, the cost of entrance into the tourbillon club, at least for a decent quality one is so high, it is almost ridiculous. While there are many tourbillon options out there, the average price for them is between $50,000 and $90,000. You can get a good quality certified chronometer watch for about $2,000. There are also cheap no-name watches that call themselves tourbillon watches, but really are not. There is no governing agency ready to shut down rogue watch makers. Just don’t expect that a $50 “Classic Tourbillon Extreme” on eBay is anything close to what a tourbillon really is.